One team has been scoring goals as though they were playing in the run-and-gun 1980s. The other team’s goalie has been stopping pucks at a remarkable percentage. Chicago (2-0-1) has pumped in 15 goals in its first three games, thanks in part to an early revival from its long-time franchise players. 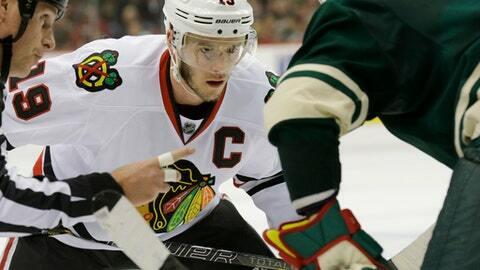 Jonathan Toews has five markers, third in the league behind Toronto‘s 1-2 punch of Auston Matthews and John Tavares. Patrick Kane has bagged four goals. As for Minnesota (0-1-1), it’s managed just two goals in two games, but Devan Dubnyk has done his best impression of a pitcher keeping his team alive without much run support. After a 36-save performance in a season-opening 4-1 loss at Colorado Oct. 4 — the last two goals were empty-netters — Dubnyk stopped 41 of 42 shots in a 2-1 shootout defeat Saturday night against Vegas. The 6-foot-6 Dubnyk owns a ridiculous .963 save percentage, yet doesn’t have a win to his credit. Is the four-day break between games something that worries him? While Dubnyk tries to maintain his form, the Wild want to find their goal-scoring touch. More puck possession would help, as would more shots. They’ve been outshot 82-51 in the first two games, and it’s hard to win in the NHL with such a discrepancy. “We haven’t been up to par yet, or even close, I think,” said Wild center Charlie Coyle. The Blackhawks’ arrival could spur a revival for the Minnesota offense. Only Vancouver has allowed as many goals (14) as Chicago, which has struggled for consistency between the pipes in the continued absence of two-time Stanley Cup-winning goalie Corey Crawford.
.@KatieEmmer channels her inner Linval Joseph and Madonna in this week's episode of #SotaScoop! Chicago has minimized the damage of Ward’s .843 save percentage with the hot start of its mainstays. Toews’ hat trick keyed a 5-4 overtime win Saturday night in St. Louis, while Kane produced a pair of goals to wipe out the Maple Leafs‘ third period lead and earn a “loser” point for the Blackhawks. “I thought a lot of different guys chipped in and did some good things tonight,” Kane said of the Toronto game.